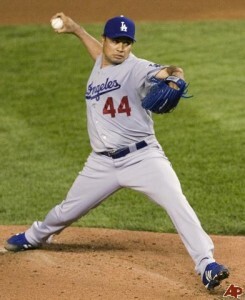 Vicente Padilla was tapped to start for the L.A. Dodgers in today’s National League Championship Series game against the Phillies. The Dodgers are up against the wall, facing playoff elimination, and it’s Padilla’s job to bail them out. Kind of like what he did for a group of people here in Bremerton two years ago. Padilla’s $25k bailout wasn’t enough for El Centro de la Familia in the long-term, but it was a great gesture and, along with the United Way, kept the place afloat for another year. For all of you here in Kitsap who still feel a connection to the historic USS Missouri, which was mothballed on Bremerton’s waterfront for decades, here’s a little update. 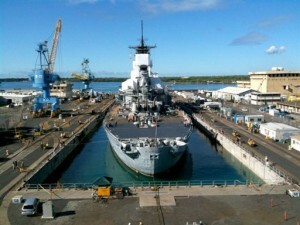 The ship was towed from its tourist spot near the USS Arizona Memorial Visitor Center yesterday and into a Pearl Harbor Naval Shipyard drydock. She’ll be back open for tours — they cost $20 per person — in December. I visited the ship last month. They were doing early painting touch up work, but it still was open for tours. I didn’t visit it when it was in Bremerton; I probably wasn’t old enough to appreciate it at the time. But I remember the fight when its departure from Bremerton was announced. It was downright vicious, involving a federal lawsuit and strong words from our local Congressman. The ship was mothballed in front of Puget Sound Naval Shipyard from 1954 to 1984. Perhaps because of the popularity of the tours and the exposure it received during the 1962 World’s Fair in Seattle, other cities began clamoring for visits from the Mo. The ship was towed to Long Beach, Calif., and recommissioned in 1984. It toured the world and was deployed during the Gulf War. Its return to Bremerton was promised by then-Navy Secretary H. Lawrence Garrett III in 1989, and it came back for its second mothballing in 1992. In 1995, the year of the 50th anniversary of Japan’s surrender 1995, several cities — including Bremerton, Pearl Harbor, and Long Beach, Calif. — petitioned to become its permanent home. Hawaii, of course, won. Last year, 10 years after it was towed away, some Kitsap residents still felt saddened by the battleship’s departure. No matter the argument about where the ship belongs, it serves its purpose at the Arizona memorial in Pearl Harbor. As one of our commenters put it, the Missouri provides a “period” to the memorial’s statement on the attacks on Pearl Harbor. Our friend The Bremelogger hosted a debate for Maupin and Lent last night, following a Monday League of Women Voters event for the Bremerton mayoral hopefuls. No slight at the LWV, since they’ve been in the business of promoting elections for years and have covered the county with forums this season, but when phrases like “pool of blood” and a question about urban chickens* become part of the debate, you know it’s not the typical candidates forum. Which is a good thing, given a primary turnout that clearly showed many voters aren’t being reached. So the candidates were good sports to participate in something a bit out of the ordinary. That was the third public forum between these two I’ve watched, not including two editorial board interviews***. So I’m a little fatigued on listening to how downtown can improve or what the budget strategy should be next year****. A lot of the viewpoints have been very similar, and the tone, for the most part, has been cordial. Unfortunately, that doesn’t always paint a clear picture to help voters decide. The two butted heads just a bit in our interview last week, when Maupin scoffed at Lent’s suggestion to save money on future street repairs by including the work with stormwater projects funded by the state. Other than that, the gloves stayed on. Wednesday’s most aggressive statement came again from the sitting city councilman, asked to name a different between the two. Maupin had played on his working-class Aberdeen roots and shipyard background early in the interview, and concluded with this: “She’s a politician, I’m not.” (Lent was a county commissioner for one term, before losing in the 2006 primary.) Lent wasn’t baited by the comment, and stuck to her guns by simply reiterating her passion for the city, business background and “fresh” perspective. Lent’s best point of the evening, which also came up in our interview and seems to be one of the campaign’s really good ideas, was her promise to aggressively court small manufacturing businesses here from the Kent Valley, where they are in pretty serious danger of being flooded by the Green River due to a leaking dam in the Cascades. The other state issue, Tim Eyeman’s I-1033, came up Monday. Both Lent and Maupin said they disagreed with initiative, as presently worded. Both answered the “pool of blood” question with assurances that law enforcement, and cleaning up blighted neighborhoods that harm Bremerton’s reputation, will be a priority. And then they walked out onto those very streets in the Callow neighborhood, letting the kids stay and listen to Boise rockers Finn Riggins*****. The opening act had done its job. *City Councilman Roy Runyon is hosting a district meeting at 5:30 tonight at Cora’s Diner on 4th Street. On the agenda? Yup. Urban chickens. ***Endorsements begin this weekend and run through next week, if you want to hold your ballot a few days to see our opinion. ****Believe it or not, there’s at least two more coming up. Monday from 5-8 p.m., Mike Siegel of KITZ radio will interview the two at the Comfort Inn, and then Tuesday they’ll be at the Chamber of Commerce’s Eggs and Issues breakfast (also, incidentally, held at a bar). *****Kornelis told me he used to be in Finn Riggins. But having two drummers is awkward in a rock band, and that was that. D. Anything else we might ask about her run for mayor. That’s the information I received by telephone. She plans to send an e-mail out with the details. I don’t know if this is technically a public event or invite-only. I’ll update you when I know. The event is at 2 p.m. Thursday at 853 Sixth St. in Bremerton, the Kitsap Business Center. UPDATE: I received the e-mail and it had less information than what I had above, except for the name. You are invited to a mayoral facts; Disclosure Forum! That U.S. Postal Service building at Sixth and Pacific has a buyer, a postal service spokesman said Tuesday. The deal, however, is still in the works. Under the current terms the post office would maintain a smaller presence in the building. The spokesman did not know who the potential buyer is or what else is planned. Cool Visuals, But What’s Up With That Bus? Angela Dice, the Kitsap Sun’s Web know-it-all, sent me a link to what is a really cool visual of Bremerton’s waterfront potential. The videos adorn you with a virtual jet pack as you hover over the new marina and whisk by condos, many of which have not been built, or purchased. The second video, though, made me wonder how respect for the law was envisioned as part of Bremerton’s future culture. Once the most violent city per capita in the state, (You weren’t far behind, Port Orchard, so stop snickering.) the new developments and resulting bustle of law abiding citizens were bound to change the personality of the city. 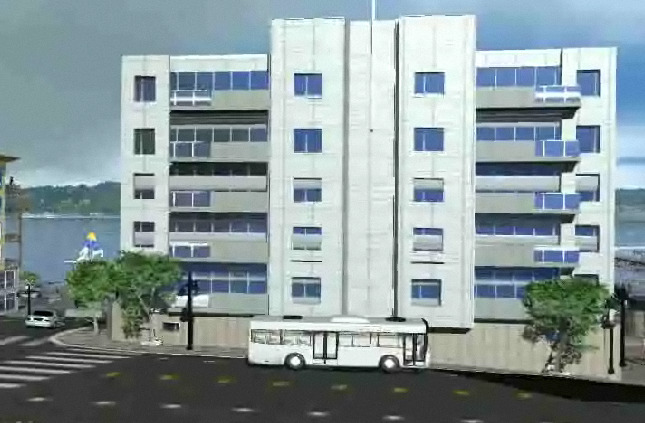 However, it appears the designers envisioned a new form of lawlessness in which bus drivers consider traditional lane direction rules to be optional. Tuesday afternoon our editorial board will host the Bremerton candidates for mayor, Patty Lent and Will Maupin. That’s the first of three forums the two will attend in subsequent weeks*, so hopefully this race is about to develop in earnest. Steve Gardner is working on profiles of the candidates and the race for coming stories in the Sun, so watch for that as well. Our interview begins at 4 p.m. (office jockeys, tell your boss it’s a work-related “webinar” you’re watching). There will be a link to the live video at kitsapsun.com when we get started, and the archived video will go up in the evening at kitsapsun.com/2009/editorial-videos. Our other election interviews are there now, and our editorial board endorsements will start rolling out next week. I’ve got some questions in mind for the interview, but I’m open to any suggestions you might have. The likely topics include ferry service, diversity in the city’s tax base, neighborhood improvement plans and what’s to be done about the growth in hot dog vendors downtown (ok, we’ll get to three of those). But if there’s something you’d like to hear about, throw it in the comments below or email me at dnelson(at)kitsapsun.com. *Oct. 14, The Bremelog is sponsoring a debate, 7 p.m. at the Hi-Fidelity Lounge in West Bremerton, and Oct. 20 is the early morning Eggs and Issues bash sponsored by the Chamber of Commerce at the Cloverleaf.